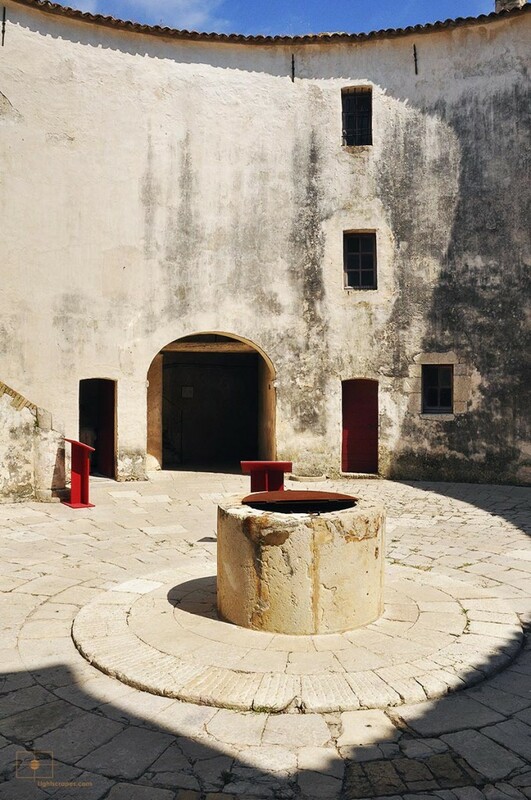 Central keep with well and gates in an architectural photograph of Fort Carre at Antibes France. Constructed in the 16th century, the star shaped fortress guarded the entrance to Antibes’ harbor for over 400 years. Atmospheric of a different time and place, the central keep presents the visitor with a sense of an incomprehensibly alien Europe where active warfare was the norm and vigilance had to remain constant. Red podiums displaying placards with bits of information emphasize the building’s transformation from one needed for existential survival to an attraction for tourists. Shadows appear as if gear works of a clock intertwined with the circular forms of the keep illuminated by the mid-day Côte d’Azur sun.